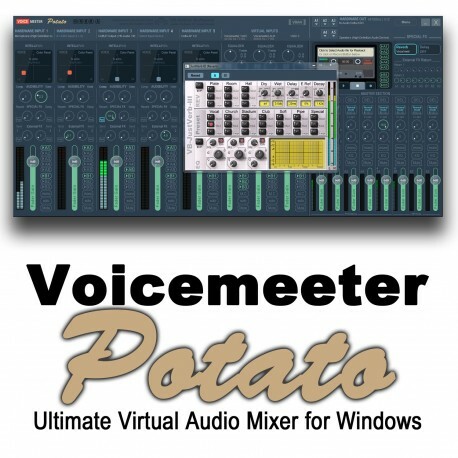 Voicemeeter Potato is the ultimate audio mixer for Windows PC's. With 5 physical I/O and 3 Virtuals, Voicemeeter Potato can also be used in small music band and professional broadcast domain. With new special fx and multi layer mixer, Voicemeeter Potato offers same features as audio pro mixer. Before License purchase, you must have installed and tested the Software Application. Voicemeeter Potato is distributed as donationware with an activation code for your PC only. Adjust the license price and enter your Challenge code! Download page & User manual: www.voicemeeter.com . I support the R&D team! Compatibility: Windows XP, VISTA, WIN7, 8, 8.1, WIN 10 (32 or 64 bits). The Response code will activate your license on your PC Only. If your challenge code is changed (e.g. PC change) you may get another response code. This activation code can be regenerate once in your account “My License” page.